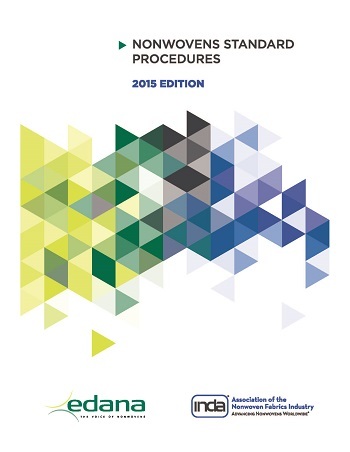 September 17, 2015 – Cary, North Carolina, EDANA and INDA, the leading global nonwovens associations, jointly announce the launch of the 2015 edition of standard procedures for the nonwovens and related industries. These Nonwovens Standard Procedures help technically define the nonwovens industry, with specifiers for the properties, composition, and specifications of its products. Offering harmonized language for the industry across the USA and Europe, and recognized by many other individual markets, the procedures offer a way for the nonwovens industry to communicate both across the globe, and within the supply chain to ensure that product properties can be consistently described, produced, and tested. The harmonized methods contained in the Nonwovens Standard Procedures (NWSP) edition include 95 individual test procedures and guidance documents to support applications across the nonwovens and related industries, and are available on both www.inda.org and www.edana.org. “Nonwovens Standard Procedures is designed to provide a standard series of test methods of the various properties desired in nonwovens and engineered fabrics. It is an indispensable resource for innovators and product developers to communicate with buying influences and ensure their products meet the exact specifications demanded by markets and customers. Additionally, laboratory personnel will benefit with enhanced accessibility to the most comprehensive body of nonwovens test methods available in the industry,” said Dave Rousse, INDA President. The 2015 edition includes updated or modified procedures with a new numbering structure to make the document more intuitive to search and use. Additionally, each method now also includes a page to summarize and track relevant changes made to the document. In an effort to make all methods more consistent, each one is now presented in a format building on the International Standards Organisation (ISO) template, facilitating any future possible submission to ISO in an effort to become a recognized international standard or technical specification. As in previous editions, the table of contents for the NWSP documents includes references to existing related ISO standards, which makes it easier for technicians to choose the most relevant procedure or methods to apply to their product.